(25 September 2017) – EU officials and stakeholders from local and regional government, the European Parliament, ecovillages, the Transition movement, community initiatives and researchers welcomed the first European Day of Sustainable Communities at a launch conference in Brussels on 22nd September, co-hosted by ECOLISE and the European Economic and Social Committee (EESC). Marion Esnault, of the ongoing Fete des Possibles in France and Belgium which has some 1500 events celebrating transformative community-led initiatives asked: ‘What are politicians waiting for? 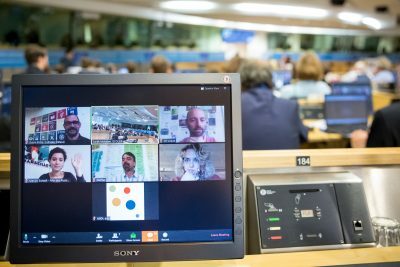 ‘Citizens understand that we need change if we want to maintain civilization as we know it.’ She was one of five people to join the meeting live from around Europe using online meeting software, Zoom, a tool regularly used by ECOLISE members. Speaking from a global perspective, Kosha Joubert, executive director of Global Ecovillage Network International said that Europe has a moral imperative to take a leadership role and support local communities. ‘Funding is available but not much arrives on the ground to the communities,’ she said. Philippe Lambert, MEP, co-chair of the Greens/EFA group, who joined the conference for the panel discussion said: ‘No one has the intelligence to singly direct the transition. We need to harness our ‘collective intelligence’, ‘modify our democratic models’ in order to do so and lift the roadblocks to local initiatives, he said. Guest speaker Artur Runge-Metzger, director of climate strategy at the European Commission’s DG Clima, said that without the groundswell of community action the Paris agreement would not have been possible. ‘It cannot be left to governments alone to do top-down implementation,’ he said. Lidija Pavic-Rogosic an EESC member from Croatia said the EESC supports local initiatives in its opinions that it sends to the Commission, the Parliament and the Council. She said we need to increase the scale up and to look at the interaction of local initiatives and local governments. He also said that there was a debate about trust and control. In Europe he said trust was generally being offered to big interests – citing Dieselgate by way of example – while ‘small interests were controlled down to the last digit’. He said people have a collective responsibility and that action ‘cannot stop in our little communities’. He ended with a plea to ECOLISE to ‘please, please, please continue’. Robert Hall, president of ECOLISE, said the organisation was delighted that members in 15 countries had spontaneously organised events to celebrate the first ever European Day of Sustainable Communities. ‘Now we need more cohesion between action in communities, researchers and policy makers,’ he said. The conference was facilitated by Sarah McAdam, Delivery Director for Transition Network.